Overview - Charlie Rankin (Dorff) is out of prison, but not out of trouble. Indebted to the man who saved his life behind bars (Dafoe), Charlie must now carry out a murder to settle the score. But things start to change for Charlie when he meets Florence (Monaghan), a mysterious and beautiful lost soul who sees the good hidden beneath his tough exterior. When the hit goes bad, it's Charlie's life that is on the line, and he'll have to figure out how to settle his debts – and keep Florence out of danger – before his past catches up to him. Unpleasant. I think that might be the best word to describe the experience of watching David Jacobson's 'Tomorrow You're Gone.' And by unpleasant, I'm not really referring to any particularly disturbing content. No, it's unpleasant because of how incredibly dull, lifeless, grimy, plodding, and ultimately pointless the whole runtime turns out to be. A pale malaise of empty, grungy style washes over a nearly comatose plot filled with ill-conceived characters, and even worse, as disagreeable as the whole experience is, by the time the credits role, the film leaves absolutely no impression whatsoever. Beyond a general sense of ugliness, it's so much of a nonentity that it barely even registers. That is, with the exception of one notable side effect: It made me sleepy. Very sleepy. After being released from prison, Charlie (Stephen Dorff) is forced to pay off a debt he owes to his jail-time benefactor, a criminal known as "The Buddha" (Willem Dafoe). Contracted to kill a stranger that The Buddha wants dead, the ex-con struggles to come to terms with his unsavory task while increasing fits of anger and paranoia begin to take a toll on his sanity. When he meets another disillusioned and broken soul, Florence (Michelle Monaghan), his internal turmoil starts to ease. Torn between a potential new lease on life and his murderous obligations, Charlie attempts to escape from his past before it's too late. Defined solely by a perpetual grimace ingrained on his face, Charlie turns out to be a truly horrible protagonist with virtually no substance or personality layered beneath his confused, world-weary scowl. The character is prone to bursts of delusional rage, but these isolated episodes don't amount to much, and as a whole the man is simply a bore to watch. While he has little to work with on the page, Stephen Dorff's performance is wholly one-note, and the actor simply lets his wrinkled brow do all the heavy lifting. Michelle Monaghan seems to at least be trying, but Florence is such a poorly conceptualized character that her efforts are all in vain. A floozy with a supposed heart of gold, she attempts to "heal" Charlie and help him find redemption, but her trashy demeanor is off-putting and quite annoying. I understand that this is supposed to be a pair of troubled lost souls, but they're so thinly developed that they don't elicit a single ounce of sympathy or emotion. Willem Dafoe is also thrown in to bolster the already dangerously high "craggy forehead" quotient, but his screen time is insignificant and outside of the climax, he isn't given a whole lot to do when he does appear. Mirroring Dorff's own blank expression of brooding discomfort, the plot itself is essentially nonexistent. Long stretches of flatlined narrative are punctuated by momentary sparks of drama or violence, but these instances are all fairly inconsequential. Periodic excursions into slightly surreal delusions are also present, but instead of adding intrigue, these moments are muddled, confusing, and futile. The majority of the film ends up focusing on Charlie and Florence's bizarre coupling, which leads to a series of dead-end scenes where the former attempts to avoid the latter's repeated sexual advances. The inane dialogue offers nothing to latch onto, and though the script does attempt to examine concepts dealing with faith and redemption, these half-hearted musings on the soul are totally haphazard and asinine. As a whole, the script simply feels incomplete and pointless. This overall disregard for story might not have been quite so damning if the film's prevailing mood and style actually offered any interest, but sadly, that's just not the case. Director David Jacobson soaks the movie in an unappealing, grimy aesthetic, and while this visual style does suit the content well enough, the film's occasional avant-garde flourishes add up to very little. Disorienting POV shots and drifting focus shifts all serve to enhance Charlie's paranoid perception, but these flashy devices prove to be more irritating than enlightening. Close-up shots of an old TV, highlighting all the scan lines in the picture, seep into the rest of the proceedings as well, leading to an odd shot here and there that feature an intentionally low-fi, flickering appearance. Likewise, a subtle distorting effect is visible in some sequences, but again, outside of faintly reinforcing the movie's dirty, creepy atmosphere, these stylistic diversions are mostly superficial and useless, failing to create a truly engrossing mood. With a listless plot, vacant drama, shallow style, and lifeless characters, 'Tomorrow You're Gone' is simply a waste of time. Outside of a fleeting scene or two, nothing even remotely interesting happens. And even forgetting the terrible storytelling, if viewed purely as an abstract mood piece the film is still horribly dull and ineffectual. A general air of dreary stagnation and cinematic weariness casts an empty shadow over the entire experience, and the movie ultimately ends up feeling unfinished and meaningless. On the other hand, its virtually comatose runtime does have an odd knack for engendering fatigue… so, as a potential cure for insomnia the film might have some marginal value. Outside of the sleepless, however, most will definitely want to avoid this one. 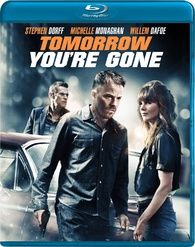 Image Entertainment brings 'Tomorrow You're Gone' to Blu-ray on a BD-25 disc housed in a keepcase with a cardboard slipcover. Some skippable trailers play upon start up before transitioning to a standard menu. The release is region A coded. The movie is provided with a 1080p/AVC MPEG-4 transfer in the 2.35:1 aspect ratio. Intentionally drab and stylized, the image is technically solid but rarely very appealing. The digital source is mostly clean, but there are a few fleeting shots where the picture's otherwise grain-like sheen of noise spikes to more distracting levels. Detail is good throughout, especially in close-ups, revealing a nice sense of fine texture in clothing and facial features, bringing every confused, tired crease in Stephen Dorff's permanent grimace to life. The color palette is undersaturated and often adheres to sickly blues, grays, and yellows, though a few splashes of red sneak in to offer some contrasting pop. White levels are overexposed, reinforcing the faintly dreamy aesthetic, but the overall image can sometimes look a bit dim and flat. While black levels are deep, shadow delineation is a tad murky and occasionally tinged blue. 'Tomorrow You're Gone' features a deliberately grimy aesthetic which works well with the story's dreary tone and atmosphere. The resulting picture is quite drab and there are some minor inconsistencies, but the transfer is free from any major problems. The film is presented with an English DTS-HD Master Audio 5.1 track and optional English subtitles. The sound design has its moments, but as a whole the track isn't quite as moody or immersive as it could be. Speech is clean and crisp, but the often whispered dialogue is mixed a little too low. The movie is relatively quiet, but appropriate ambiance adds a subtle sense of space and atmosphere to the proceedings, marginally enhancing the various grungy bar, motel, and street locations with decent directionality and imaging between speakers when called for (passing police cars, for instance). Though a bit anemic during several stretches, certain scenes do offer more impactful immersion and fidelity, including one key sequence that features several gunshots that carry an intense jolt. Moody low frequency cues are also tied to the score and dynamic range is distortion free. Restrained but fitting, the audio mix does what it needs to do but rarely offers much else. There are absolutely no special features included. 'Tomorrow You're Gone' is a cinematically unpleasant, languid, meaningless, and utterly dull film. One-note, stylistically superficial, and blandly obscure, the movie is a complete waste of time. The technical presentation is pretty good, however, with solid video and audio. There are no special features, but in this case, I can't say that I really mind. Insomniacs might find some value in this disc as a potential sleep aide, but all other viewers will want to avoid it.